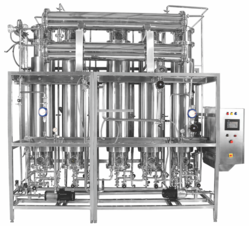 Our range of products include pharmaceutical multi column distillation plant and multi column distillation plant. Multi Column Distilled Water(WFI) Plant designed to produce Low Conductivity 100% Pyrogen / Endotoxin free Water for Injection which confirms to IP/BP/EP/USP standard. Multi Column Distilled Water (WFI) Plant uses a staged evaporation and condensation process to produce water for injection. Plant steam is applied only to the first column evaporator (effect) with the subsequent columns using the steam produced in the previous column as the source of energy. Similarly, cooling water is applied only at the condenser to condense pure steam into water for injection. The columns subsequent to the first column use feed water as the cooling source, which is evaporated, as the pure steam from the preceding column is condensed producing water for injection. Produced distillate and remaining pure steam is condensed in the condenser and flowing further to the plant's water for injection tank. We are manufacturers & exporters of Multi Column Distillation Plant. The Multi Column Distillation plant is used to produce pyrogen / endotoxin free water (Water For Injection -WFI) by distillation process. As the name suggests the unit consists of a series of pressure vessels in the form of columns / stills which are inter connected. Our plant is based on falling film evaporator technology (Finn aqua) and its design is based on cGMP guidelines. Boiler steam is utilised only in the first column to produce pure steam and remaining columns utilise this pure steam to produce furthermore pure steam. Our plant is very economical as the boiler steam is utilised only in the first column. The distilled water meets FDA, EP,USP, IP and BP standards.